What’s on in the park and news about the park itself. So far ( May 2017) it has been a great blossom year – the early Spring bulbs were over very quickly – the snowdrops, crocuses etc.but the daffodils and the white cherry blossom has been a joy. Wecontinue to add interest to the park – both for people and for wildlife .. 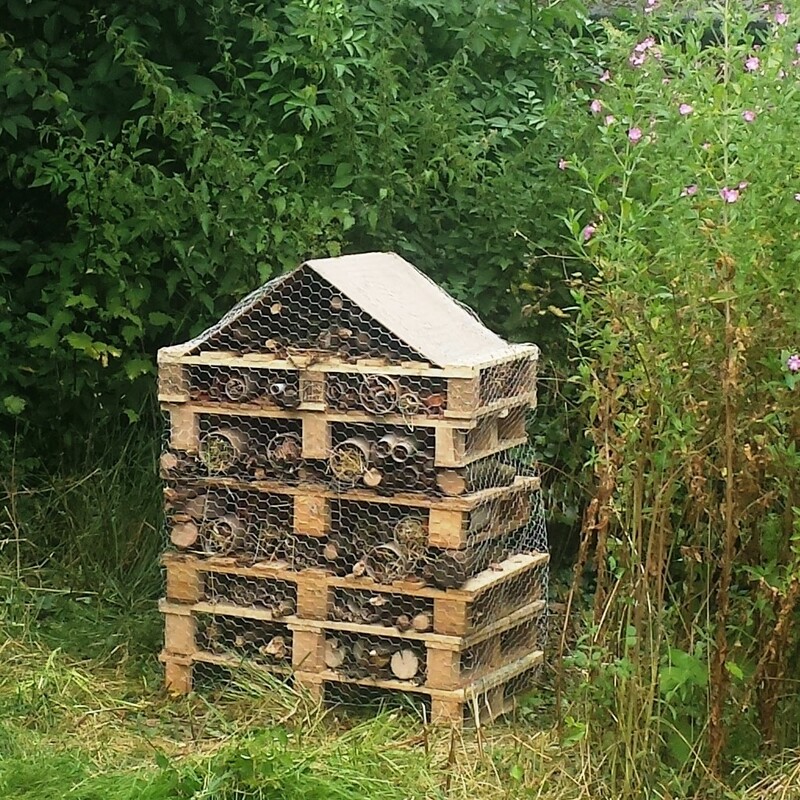 This Summer we have added a Bug Hotel to the facilities for wildlife. and we are already planning the new plantings for this Autumn – one or two more flowering and berry bearing trees in the Park and some more Spring bulbs. This will be our 5th Winter of adding spring bulbs. Do you remember a couple of years back when two new benches were added to Holy Ghost Field – unfortunately installed in the wrong place and subsequently vandalised? We got the Council to take the remains away but the promise to replace them never materialized ……we have generated enough money ourselves now to pay for at least one replacement by the Dellwood Path …it should be in position by the Spring. We had 2 projects for this Winter season – planting yet more bulbs and this time a few wild flower plug plants, and tackling once and for all the hedgerow at the northern end of the Dellwood hedgerow. Working through November and December ( fortunately the weather was very mild) we have planted a host of daffodils and narcissus in various locations and more crocuses along with some more snowdrops to compensate for the loss of the original snowdrop stock which has been declining in recent years. This year we also had the opportunity to plant some genuine wild seed primroses in a shady part of the park. This mini-project was generously sponsored by two local residents – for which our thanks! We have made several attempts over the years to improve the hedgerow by the Dellwood path. Historically some residents in Pitman Close planted and have nurtured what is now a mature hedgerow – full of bird nesting and roosting facilities. But the hedgerow is not continuous, and at various places there are gaps which we hope to fill in with additional high quality shrub species. At the northern end, the hedge was completely absent , replaced by a series of ash saplings which over the years had grown into a line of ugly and vigorous trees which were cut back and regrew each year. Ash cannot be made into a hedge in any form. With the agreement of the local residents we finally negotiated with the borough grounds maintenance staff for the ask to be removed or killed off, the land to be cleared of a lot of accumulated rubbish and for a new hedgerow to be established. The replanting of the hedge shrubs has started – more will follow in the coming months until the planting task is completed. 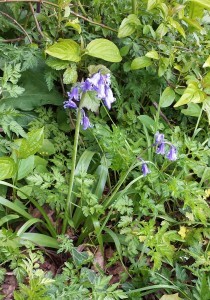 We also hope to add hedgerow wild flowers at the base of the hedgerow – again a bit later in Spring. At that point we have to sit back and wait – for Nature to play its part. A wildlife friendly hedge is not something that can be created over night – it will be 3 -4 years before it is recognisable as a hedge and 10 years before it is a respectable size. What a glorious day .. the Car Boot Sale was a great success, there were children’s amusements, displays and all sorts of refreshments available – and guess what … everyone finally got to have a family picnic in the park! We explained the scheme we are working to at the top of the Holy Ghost Field where we cut back the old and decayed trees to rejuvenate the hedgerow. In February and April we planted new trees and shrubs helped by the Kempshott Scouts planting a row of new hazels and hawthorns on both sides of the old hedgerow, and adding some new young trees to the area ajoning the hedgerow. You can’t keep a good scrambler down! On the old hedge line the bramble, briar and ivy roots are pushing up new growth with enthusiasm.The new young hazels and hawthorns have all taken root and are doing well. In the corner of the field. We have some daffodils from previous years which are thriving and we have added a few wild flower plugs (mainly lesser knapweed) which we had in stock. We added some young hawthorns and birch to the two big trees donated by the Council but sadly someone decided to steal them a few weeks later. We will be replacing them this autumn when we will be seeding this triangle of ground with wildflower seed. We had high hopes for a good display of spring flowers this Spring after all the planting in Autumn last year. The bulbs did make a show, each in turn, but despite a mild winter, none of the blossoms lasted very long – so the impact was muted. The Snowdrops had a good year – particularly by the dead hedging on the end of the hedgerow by the car park. The effect of more light and less competition was magical. The crocuses appeared but were soon gone – so we did not event get a good picture this year. The Winter Aconites under the limes showed up over a number of weeks – we counted 50 + sets of flower – but next year they should all come out together and be more impressive. We added more squills under the trees beside the main car park but their display was very muted – they were there – we counted over 50 sets of flowers but again we hope that the second year display will be better. 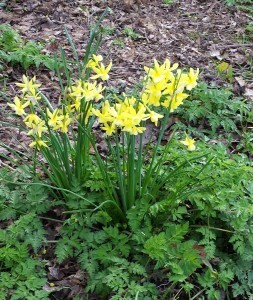 The good news is the display of daffodils which were in flower from March to the end of April – a good show. 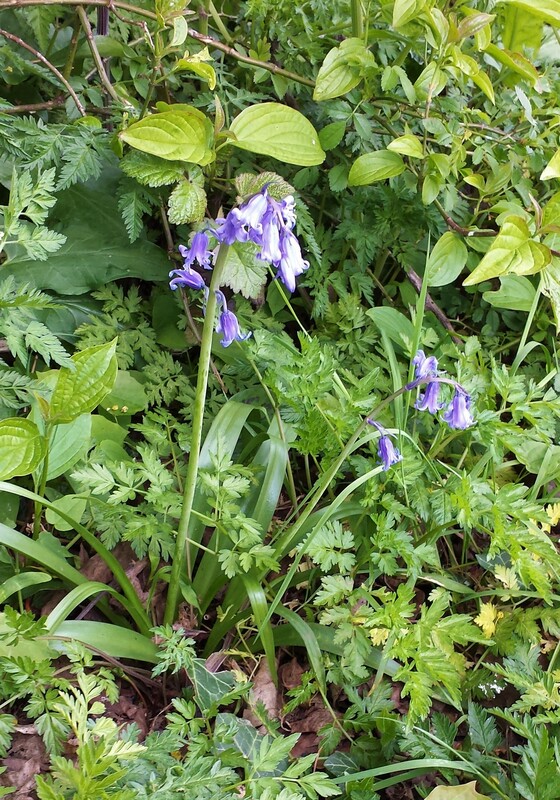 January 2014 : News from the Park: What is happening about the hedgerows? You may have noticed the changes to the old hedgerow by the tennis courts in Stratton Park. A hedgerow once established does need to be maintained – nothing comes for free. If managed properly a hedgerow will last for 500 years. If neglected it will end up looking like our hedgerow. Our hedge was planted in the 19th century, we are not sure when, definitely after 1790 and possibly as late as 1890. 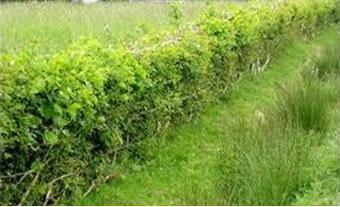 Right up to the 19th century a hedgerow was created to mark a boundary - a field boundary or a property boundary. This is in the days before barbed wire and electric cattle fencing , so a hedge was created with prickly shrubs - hawthorn and blackthorn which discouraged cattle from pushing through. To remain effective the hedge needed to be maintained regularly by trimming the top and sides or it would develop gaps. The hedge row would be created by digging two small parallel ditches with the earth piled up between them,. The bank would then be planted with hawthorns, interspersed with hazel, crab apple, blackthorn, elder and field maple. The 19th century practice was then to plant young English hardwoods at intervals - ash, elm, beech and oak. The individual English hardwood trees along a hedgerow can last up to 300 years having reached maturity in 100 – 150 years, after which they are in decline and will gradually decay. New replacement hardwoods can be planted but they will struggle because the ground is already colonised by the roots of the other trees and bushes on the hedge line. The constituents of the hedge itself will last hundreds of years if managed properly – trimmed or layed to keep it compact. Hedgerow shrubs differ from trees in that they do not develop just one main stem but many stems from the base, and indeed are happy to keep generating new stems if the older ones are cut back. Again ,unlike a tree, they cannot support growth above 15 – 20 feet tall. 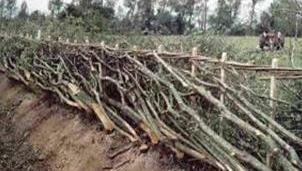 The technique of laying involves cutting much of the growth back to the ground and partially cutting through the main upright healthy branches at base leaving just 30 % of the thickness of each still in place. The branch is then bent over to a 45% angle or more and held down by stakes and hazel bindings.. This sounds very drastic but done properly the hedge is rejuvenated and will grow and prosper for another 30 – 40 years before needing renovation again. If however the hedge shrubs are allowed to just grow unchecked for 40 – 50 years they will become to old and too stiff to be layed in this way. Even worse, if the sides of the hedge are trimmed back regularly but the top is allowed to continue to grow upwards, the hawthorn, the main element in the hedge, will grow to 10 – 15 feet tall, become over mature and then decay and fall over. That is what has happened with our hedge.- it is too old to lay and too old to cut back to a hedge shape. In the longer term, as sections die and fall , partial regeneration by cutting back to base and some new planting is our best option. This is what has happened at the southern end of the hedge nearest the Car Park. Of the 5 original hawthorn roots in this section 3 had fallen and on close inspection one other was completely decayed – held up only by the ivy on it. The decision was taken to reduce all 5 shrubs to their root bases and cut back the rose briar and other small shrubs at the side of the stumps. To keep the hedgerow line and offer a rich habitat for invertebrates etc. much of the material has been retained in a ‘dead hedge’ . Some of the roots below this material may regenerate and sprout new growth over the next two years – but this is not guaranteed from such decayed roots - we will have to wait and see. Meanwhile new young hawthorn and hazel shrubs will be planted along side the dead hedging and in 15 years we may well have a young and thriving new hedge - but only if it is properly maintained. Further along the hedgerow we have blocked some of the gaps up so that young shrubs can grow to eventually fill the spaces, leaving 3 main walk-throughs. for park users. Young hedgerwo shrubs gro very slowly here as they are competing with established tree roots. Patience is needed! Recently, part of one of our old crab-apple trees fell over – it was completely decayed and hollowed out at the base and finally succumbed to old age. Fortunately we have some crab apple whips which in future years can be used to form part of the hedgerow again. In our December Newsletter we asked members for their opinions on long term projects to improve the quality of Stratton Park. We need as many replies as possible so here iare the survey details – do pleqase email us your response. We have completed our 2013 bulb planting programme, thanks again to the Scouts and Guides for their help ( many hands DO make light work). Details of the 27th October AGM, the Chairman’s report and the financial statement for the year can be found here. The scouts and guides will be helping us plant bulbs again in November, in December we will start hedgerow maintenance on the Dellwood Hedgerow and the Holy Ghost Field Hedgerow.